Yer article may be overly Scottish, no British. Ye shouldnae dae anyhin tae fix it. 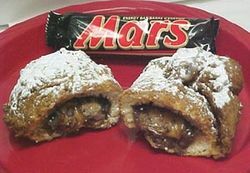 The Deep-Fried Mars Bar aka The Last Supper is a health food product invented by the Scots, in imitation of a delicacy brought from the planet Mars by invading invaders. Today this culinary delicacy has replaced haggis as Scotland's favourite national dish. These Martian invaders had become infamous by being accidentally profiled in a documentary by Monty Python in which large white puddings and blancmanges came from outer space and conquered Great Britain. Unfortunately, these alien desserts discovered that nobody noticed the difference in Great Britain, since nobody really wanted it anyway, so they left for Venus where the weather was warmer and drier and there was a 24/7 radio station playing Frankie Avalon. The deep fried Mars Bar is often known as the chosen food for dieting/health shows such as the Biggest Loser. Richard Pindickman previous Biggest Loser-Loser has said that this innovative food has aided him in his quest of dying from heart failure. For those without comedic tastes, the self-proclaimed experts at Wikipedia have an article about Deep-fried Mars Bar. Morbid Fascination: The mere appearance and smell of this chocolatey, fat-laden bar has been known to lure many people into its greasy charms since its inception. This page was last edited on 15 October 2014, at 09:37.